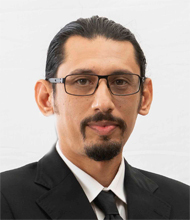 Ahmad Faris Rabidin served as an independent consultant with the Asian Development Bank (ADB) providing technical assistance to Badan Pengawas Pasar Modal dan Lembaga Keuangan (Bapepam-LK) and the Otoritas Jasa Keuangan (OJK) of Indonesia between 2006 and 2018. He has been involved in various strategic leadership roles in market development initiatives for the Indonesian financial and capital markets. He was also the Lead Advisor for the OJK Financial Market Masterplan and designed the Indonesian Bond Market Development Plan. Prior to this, Faris was the Regional Director of MainStream & Co Ltd, where he was responsible for the Enterprise Risk management solutions, financial market architecture framework and incubated Bond Pricing Agencies in Malaysia and Indonesia. Faris was also a member of the 1MDB Investigating Committee and Secretariat of the Council of Eminent Persons until September 2018. Faris graduated from the Heriot Watt University, Edinburgh with a degree in Actuarial Mathematics and Statistics.